We analyzed the outcome of incremental dialysis with single nocturnal icodextrin exchange peritoneal dialysis (PD) as the initial treatment for end-stage kidney failure in patients who have significant residual renal function. All adult patients opting for PD as renal replacement therapy, having residual renal function, and urinary KT/V of 1.0 were offered incremental dialysis with single nocturnal icodextrin exchange as initial treatment. Adequacy of dialysis was calculated at 1, 3, and 6 months and then 6 monthly. Patients were shifted to conventional PD if short of adequacy or if clinically indicated. Median period on "Ico-alone," peritonitis, exit site infection rates, and patient survival, while on this protocol, were calculated. These outcomes were compared with the cohort of contemporary patients on conventional PD. Thirteen patients were initiated on "Ico-alone" dialysis between October 2006 and October 2011. The baseline characteristics were similar when compared with cohort of conventional PD patients, except urine volume, which was more in "Ico-alone" group (1265 ± 316 vs. 551 ± 504, P = 0.000). Total KT/V at 3 months (1.63 ± 0.6 vs. 1.7 ± 0.2, P = 0.6) and at 1 year (1.64 ± 0.5 vs. 1.53 ± 0.3, P = 0.6) was similar to the cohort of conventional PD patients. Median period on "Ico-alone" was 9.6 months. Peritonitis rate was 1 episode in 56.22 vs 25.29 patient-months and exit site infection was 1 episode in 56.2 vs 189.71 patient-months in "Ico-alone" and conventional group, respectively. Patient survival was 42.84 months in "Ico-alone' vs 25.29 months in conventional dialysis ( P = 0.01). In conclusion, single icodextrin exchange offers adequate dialysis in patients with residual renal function (KT/V = 1) for a median period of 9 months. Since the advent of icodextrin in 1994, its use is continuously increasing in peritoneal dialysis (PD) patients. ,, It has proven advantage in ultrafiltration failure, high transport peritoneal membranes, and diabetics as compared to standard glucose based dialysate. ,, With successful result of a case of single nocturnal icodextrin exchange in a patient with residual renal function  and incremental dialysis in literature, , a protocol was made to offer incremental dialysis to all end-stage renal failure patients with significant residual renal function and opting PD as renal replacement therapy. We retrospectively analyzed the 5-year data for outcome of "Ico-alone" patients and compared it with that of a cohort of contemporary patients on conventional PD. This was a single-center, retrospective analysis of patients between October 2006 and October 2011. All adult patients opting for PD and significant urine output were asked for urinary clearance (KT/V). Those having a urinary KT/V of about 1 were offered incremental dialysis and initiation with single nocturnal icodextrin exchange-"Ico-alone" group. All others were initiated with conventional PD (3 exchanges of 2 L standard glucose-based dialysate). Adequacy was done at 1, 3, and 6 months and then 6 monthly. Target adequacy was kept as weekly KT/V > 1.7. Patients in "Ico-alone" group, falling short of adequacy or if clinically indicated with oliguria and/or fluid overload, were shifted to conventional PD. Those falling short of adequacy in conventional PD were offered 3 exchanges of 2.5 L or 4 exchanges per day. Patients were followed every month for clinical and biochemical examinations. Patients with HIV and hepatitis B or C were excluded from the study. Median period on "Ico-alone" was determined. Outcomes (peritonitis, exit site infection rates, and mortality) were compared between the two groups. The analysis was "intention to treat." Mean with standard deviation was calculated for continuous variables and percentage for categorical variables. Continuous variables were compared between groups by "independent sample t-test" and categorical variables by "Chi-square" test. 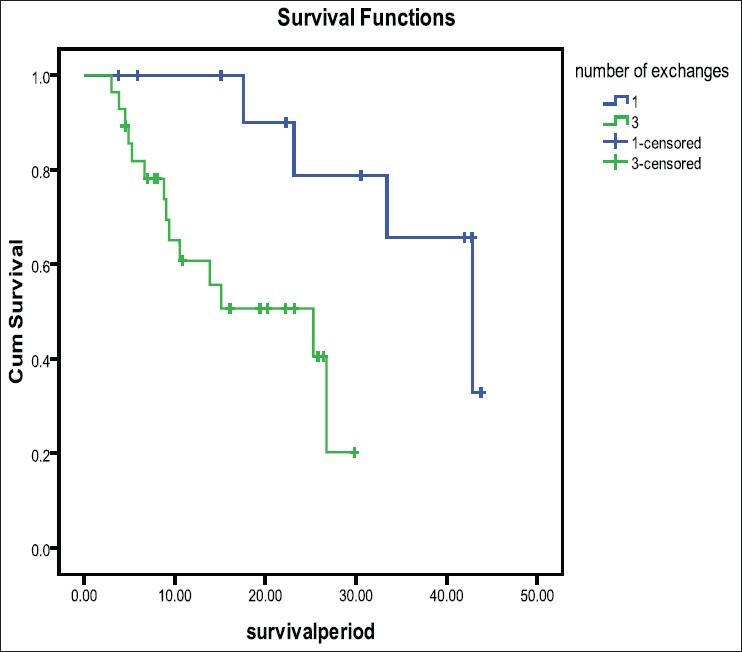 Patient survival was calculated using Kaplan-Meier survival curves and both the groups were compared by Log rank test (Mantel Cox). In view of "intention to treat" analysis, patient survival for shifted patients was done in the original group. Statistical analysis was done with SPSS 17 (SPSS Inc. Chicago, IL, USA). Forty-six adult patients were initiated on PD between October 2006 and October 2011. Their distribution in the study is shown in [Figure 1]. Baseline characteristics of study patients are shown in [Table 1] and laboratory parameters in [Table 2]. [Table 1] shows creatinine before these patients were initiated on dialysis and most of them were covered with hemodialysis during their "break in period," whereas [Table 2] creatinine values are at initiation of PD. There was no difference in demographics and laboratory parameters at initiation or at the end of the study, except for the urine output, which was 1265 ± 316 in the "Ico-alone" group and 551 ± 504 in the conventional group (P = 0.000). Mean period on therapy for "Ico-alone" was 18.8 ± 14.7 months, whereas, for conventional dialysis, it was 13.5 ± 8.3 months (P = 0.15). Calculated median period on "Ico-alone" was 9.6 months. Peritonitis rate was 1 episode in 56.22 vs 25.29 patient-months and exit site infection was 1 episode in 56.2 vs 189.71 patient-months in "Ico-alone" and conventional PD group, respectively. Over the study period, 6 patients were shifted to conventional PD. Two patients were shifted following oliguria: one patient at 3.2 months following coronary bypass surgery and another at 15 months following peritonitis. Another patient was shifted at 8.4 months for non compliance and fluid overload. Remaining 3 patients were shifted at 6.4, 7.2, and 9.6 months for inadequate dialysis. There was only 1 death in "Ico-alone" group while on treatment. It was post-operative for fracture neck of femur following a fall. In conventional group patients, there were 14 deaths in 5 years. There were 3 more deaths of "Ico alone" group patients afterwards while on conventional PD. Patient survival was 42.84 months (SE 7) in "Ico-alone" vs 25.29 months (SE 9.2) in conventional dialysis (P = 0.01) [Figure 2]. Incremental dialysis has been studied and reported earlier for patients of end-stage renal failure with residual renal function. , We are the first one to recommend icodextrin single exchange in selected group of patients. Earlier, Foggensteiner et al., initiated such patients on icodextrin single exchange, but had very high rates of sterile peritonitis (46%) and had to switch to glucose-based dialysate. Hence, based on their result, they recommended against icodextrin for incremental dialysis. However, later, review of literature showed several cases of such peritonitis reported from across the world and the possible reason was high dose of peptidoglycan in the pd fluid. The incidence of sterile peritonitis subsequently dropped significantly with regulation of peptidoglycan concentration in the pd fluid by the manufacturer. In our study, none of our patients had sterile peritonitis during "Ico-alone" exchange. In our study, the median period sustainable on single icodextrin exchange was 9.6 months, which is similar to that in other studies in literature. Foggensteiner et al.,  reported a median actuarial survival on single exchange of 297 days and Viglino et al.,  initiated PD with 2 exchanges per day and their median survival before incremental dialysis was 9.7 months. None of the studies in the literature compared the PD outcomes between those on incremental dialysis vs conventional dialysis. 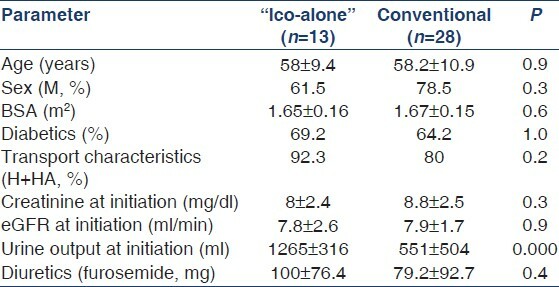 Our study for the first time compared outcome and complications on "Ico-alone" to that of conventional PD. There was only 1 death in "Ico-alone" group and that too was not related to dialysis. Survival in "Ico-alone" group was better than in the conventional group; this may reflect and reinforce the common understanding that residual renal function is the most important factor determining the outcome of PD patients. It also confirms the fact that renal clearance and not the total clearance determines the survival outcome in PD patients. "Ico-alone" patients had lesser peritonitis rates, which could be because of lesser number of "connections-disconnections" per day. However, exit site infection was higher in them, as 1 patient had recurrent infections. There are few limitations of the study. It was a single-centre study with small number of patients. However, the protocol did offer advantages and possible better quality of life, which needs to be studied and documented in larger number of patients. To conclude, "Ico-alone' single nocturnal exchange per day is a viable option in incremental PD to initiate dialysis in patients of end-stage renal failure with residual renal function without any compromise in outcomes. 1. Mistry CD, Gokal R, Peers E. A randomized clinical trial comparing isoosmolar icodextrin with hyperosmolar glucose solutions in CAPD. MIDAS Study Group. Multicenter investigations of icodextrin in ambulatory peritoneal dialysis. Kidney Int 1994;46:496-503. 2. Posthuma N, ter Wee PM, Donker AJ, Oe PL, Peers EM, Verbrugh HA. Assessment of the effectiveness, safety and biocompatibility of icodextrin in automated peritoneal dialysis. The dextrin in APD in Amsterdam (DIANA) group. Perit Dial Int 2000;20(Suppl 2):S106-13. 3. Wolfson M, Piraino B, Hamburger RJ, Morton AR. Icodextrin study group. A randomized controlled trial to evaluate the efficacy and safety of icodextrin in peritoneal dialysis. Am J Kidney Dis 2002;40:1055-65. 4. Krediet R, Mujais S. Use of icodextrin in high transport ultrafiltration failure. Kidney Int Suppl 2002;81:S53-61. 5. Bredie SJ, Bosch FH, Demacker PN, Stalenhoef AF, van Leusen R. Effect of peritoneal dialysis with an overnight icodextrin dwell on parameters of glucose and lipid metabolism. Perit Dial Int 2001;21:275-81. 6. Paniagua R, Ventura MD, Avila-Diaz M, Cisneros A, Vicente-Martinez M, Furlong MD, et al. Icodextrin improves metabolic and fluid management in high and high-average transport diabetic patients. Perit Dial Int 2009;29:422-32. 7. Jeloka TK. "Icodextrin alone" for initiation of peritoneal dialysis. Perit Dial Int 2008;28:563-4. 8. Foggensteiner L, Baylis J, Moss H, Williams P. Timely initiation of dialysis - single-exchange experience in 39 patients starting peritoneal dialysis. Perit Dial Int 2002;22:471-6. 9. Viglino G, Neri L, Barbeiri S. Incremental peritoneal dialysis: Effects on the choice of dialysis modality, residual renal function and adequacy. Kidney Int Suppl 2008;108:S52-5. 10. Goffin E. Aseptic peritonitis and icodextrin. Perit Dial Int 2006;26:314-6. 11. Bargman JM, Thorpe KE, Churchill DN, CANUSA Peritoneal Dialysis Study Group. Relative contribution of residual renal function and peritoneal clearance to adequacy of dialysis: A reanalysis of the CANUSA study. J Am Soc Nephrol 2001;12:2158-62. 12. Paniagua R, Amato D, Vonesh E, Correa-Rotter R, Ramos A, Moran J, et al. Mexican Nephrology Collaborative Study Group. Effects of increased peritoneal clearances on mortality rates in peritoneal dialysis: ADEMEX, a prospective, randomized, controlled trial. J Am Soc Nephrol 2002;13:1307-20.